The Lightning Collector and Last Battle are part of a series of images created to explore the abilities of some of the unique lighting options from the German strobe light manufacturer, Hensel. The project was completely open ended as far as what I could photograph and how. I decided to create some visual storyboards with a cinematic feel. Each were created from multiple photo shoots in numerous locations. All of them provided their own unique challenges. situations that the IQ 260 digital back really excel at. With little chance of reshooting, minimal ability to test, and exposures all over the map, the 13 stops of dynamic range gave me a lot of confidence that I would get the shots I needed. For a pro photographer that can't be underestimated, especially in situations that are not entirely under our control. 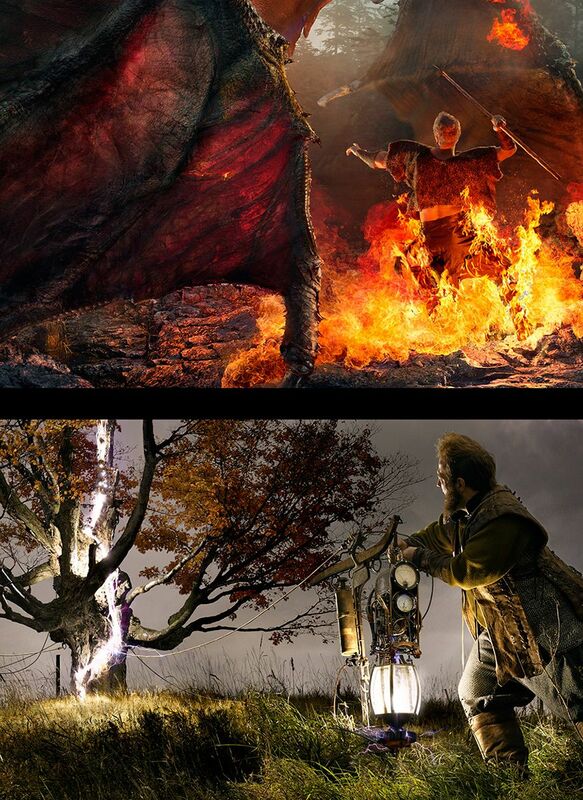 The first shot was of a battle between a man and a dragon. The dragon typically seems to lose these battles so I wanted to turn the tables for a change. One of the obvious challenges was creating a dragon without the use of a 3D CG model. I wanted to create it photographically. I started exploring macro photography hoping I would find some textures and pieces I could use to create this mythical being. Using a computer controlled rail, I mounted a Phase One 645DF+ camera, the 120mm macro lens and the set of extension tubes. With this set up I was able to shoot slices through small objects and splice the sharp bits together using a stacking program to get extreme depth of field. This opened up a whole new world of possibilities for me. With the extreme resolution things start to lose scale. The micro world starts to mimic the massive and I was able to mix shots of red cabbage, maple keys and insect parts with elephant, hippo, rhino and alligator. The file was so enormous with all the layers I had to create different sections in separate files to keep each file under 20 GB so it was manageable. I had one working file for the front wing one for the torso and head, one for the environment and one for the guy and fire. I used fibre optic lighting for the macro shots so the lighting would have a similar scale to the final scene. The environment and warrior was lit with an omni directional light stick. The second shot, “The Lightning Collector” utilized the same two light setups. I used the light stick and the fibre optic lights; I could get both of these lights in side the machine and the small omni directional light stick was great for getting up inside the tree to create the effect of the tree being lit by the lightning. The lightning in the tree was actually from the 3 million volt tesla coil. A very scary thing to shoot with sensitive camera equipment. The real lightning in the sky I captured in Kansas. Following a storm for hours and witnessing it produce a tornado was an epic event I won't soon forget. The whole experience creating these images has opened up new avenues for me to explore photographically; I will be spending a lot more time in the macro photography realm lighting with fibre optics and being consistently engrossed by the very small exemplified in extreme resolution.